Qatar signed the Conventions on 15 October 1975, Additional Protocol I (Protection of Victims of International Armed Conflicts) on April 5, 1988 and AP I Article 90 on 24 September 1991. On January 5 2005 Qatar became signatory to Additional Protocol II (Protection of Victims of Non-International Armed Conflicts). Moreover, Qatar became signatory to the Convention for the Rights of the Child (CRC) on 3 April 1995, as well as the Optional Protocol to the CRC on 25 July 2002. Qatar has been member of the OIC since 1972, and signed 5 of the 8 fundamental ILO conventions, having omitted to ratify the convention related to freedom of association (C087), freedom of collective bargaining (C098), and equal remuneration (C100). Qatar is not party to the 1951 Convention, nor its Protocol. The Convention on the Elimination of All Forms of Discrimination against Women – also called CEDAW, was approved during the General Assembly Session on 18 December, 1979 and entered into force on 3 September 1981. Qatar acceded to the Convention on April 29, 2009. Through “accession” a state accepts the offer or the opportunity to become a party to a treaty, which has already negotiated and signed by other states. It has the same legal effect as ratification. Countries that have ratified or acceded CEDAW are legally bound to put its provisions into practice, and thereby agree to submit national reports on measures taken to comply with its obligations. Such reports are to be compiled at least every four years. Qatar made some reservations, however, regarding a number of articles, mostly due to incompatibility with existent national laws or the constitution. This is the case for Article 2 (a), related to equality of men and women in the constitution; Article 9 (2), concerning children’s nationality – inconsistent with Qatari citizenship law; Article 15 paragraph 1, prescribing equality before the law – contradicts Sharia, and 4, concerning equality of freedom of movement; Article 16 (1a), prescribing the same right to enter into marriage; (1c), granting equal rights during marriage and its dissolution; (1f), listing equal rights and responsibilities with regard to guardianship, wardship, trusteeship, and adoption of children. Additionally, it does not consider itself bound by Article 29 (1), discussing dispute between states concerning interpretation or application of the Convention. It is noteworthy that Article 29 (2) specifically allows for such a reservation. Moreover Qatar made declarations insisting agreement with Article 1 (defining the term ‘discrimination of women’) does not mean it encourages extra-marital relationships, and that the ‘patterns’ mentioned in Article 5 (a), prescribing modification of social and cultural patterns, should not be understood as encouraging women to abandon their mothering roles. The Convention on the Rights of Persons with Disabilities was approved during the General Assembly session on December 13, 2006 and came into force on May 3, 2008. Simultaneously, the Optional Protocol was approved, giving the Committee on the Rights of Persons with Disabilities (CRPD) competence to examine individual complaints with regard to alleged violations by States parties to the Protocol. The CRPD is the body of independent experts that monitors implementation of the Convention. Qatar signed the Optional Protocol alongside the Convention on July 9, 2007 and ratified the latter on May 13, 2008 without any reservations. The Convention against Torture and Other Cruel, Inhuman, or Degrading Treatment or Punishment, also referred to as just the Convention against Torture, was adopted during the General Assembly session on December 10, 1984. On June 26, 1987 it was registered and thereby came into force. Its implementation is monitored by the Committee Against Torture(CAT), composed of ten individuals of various nationalities. All signatory states are obliged to send regular reports to the CAT, based on which recommendations are made. Qatar accessed to the Convention on January 11, 2000. It holds a ‘limited general reservation’ within the framework of Articles 1, defining the concept of torture; and 16 relating to the prevention of cruel, inhuman or degrading treatment not considered torture. Additionally, Qatar agrees to the mandate of the Committee as stipulated in Articles 21 and 22, to which it had previously made a reservation. The International Convention on the Protection of the Rights of All Migrant Workers and Members of their Families was approved by the General Assembly on December 18, 1990 and entered into force on July 1, 2003. Qatar is not party to the Convention. Qatar acceded to the Convention on July 22, 1976 with no reservations. Visitors returning to Qatar after only a few years of absence, invariably remark on the changes the country has experienced in such a short period. But behind the brash facades of modernist architecture, the air-conditioned shopping malls, and the confident attitude of Qatar’s cosmopolitan and well-educated youth, lie the sobering realities of a politically restrictive police state. Qatar’s police, military and internal security services continue to be controlled by the Emir. In addition to the General Intelligence Agency and the State Intelligence Security Unit, headed by powerful members of the royal family, the Emir created the State Security Agency in 2003 and an Internal Security Force in 2006. The Emir’s son, Crown prince Tamim bin Hamad, heads the Qatar Security Services Company, which is said to rely on foreign private security firms like those supplementing the Western occupation forces in Iraq. In 2006, the UN Committee against Torture criticized Qatar for ‘the lack of a comprehensive definition of torture in domestic law and the absence of training and education for law enforcement, medical personnel, and public officials about the prohibition [of torture]’. A local government funded National Human Rights Committee (NHRC) was created in 2002 by decree of the Emir. In 2005 it published its first Annual Report. According to this document, Qatar’s prisons and detention centres were ‘deficient in terms of parole, medical release, overcrowding and food’. Although the Constitution explicitly prohibits arbitrary arrests and detention, thousands of non-citizens were held at the Deportation Detention Centre without any charge or trial – sometimes for more than three years – before being expelled. Gulf Cooperation Council (GCC) citizens are held separately from non-GCC detainees and under better conditions. The new Constitution provides for freedom of the press. In 1995, the Ministry of Information was abolished by the new Emir with the aim of ‘providing more chances for the freedom of expression’. However, its supervisory tasks have slowly been transferred to other ministries and a number of new government organizations. Most prominent among these is the Qatar General Broadcasting and Television Corporation and its administrative unit, the Department of Publications. Together, these two organizations strictly control and regulate the domestic media, both audio-visual and print. However, they control more than just the press: one of the tasks of the Department of Publications is to ensure that all – national or foreign – publications and ‘artistic productions’ comply with what the government considers to be ‘culturally appropriate content’. In addition to the censorship the state continues to exert through the abovementioned organizations, security authorities have warned individuals and organizations against publishing certain articles. Moreover, the 1979 Press and Publications Law provides for criminal penalties and jail sentences for libel and slander, including injury to dignity. Taking all these direct and indirect forms of media state control into consideration, it should come as no surprise that self-censorship is standard practice among local journalists. Even the Internet has not been able to develop into a less restricted local platform for expression. The country has only one Internet provider. It is state-owned and monitors – and if deemed necessary blocks – websites, email services and chat rooms. 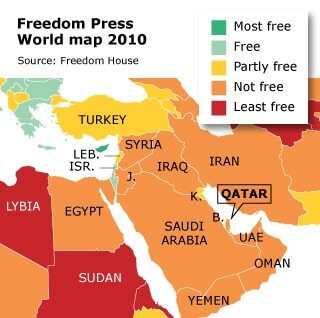 According to Freedom House’s Map of Press Freedom 2010, the status of Qatar and most other countries in the region is ‘not free’.